Below you will find articles and other useful resources to provide you with valuable information about how phone systems work, how to choose the best system to fit your needs, what to look for in a phone installer and much more. Click on the resource title to read more. What kinds of telephone stations can I add to a business phone system? The answer is simple. You can add digital, analog, and VoIP. A PBX is fancy way to say "business phone system". Since the advent of internet telephony, many residential offerings have evolved to compete with traditional local and long distance telephone service providers. 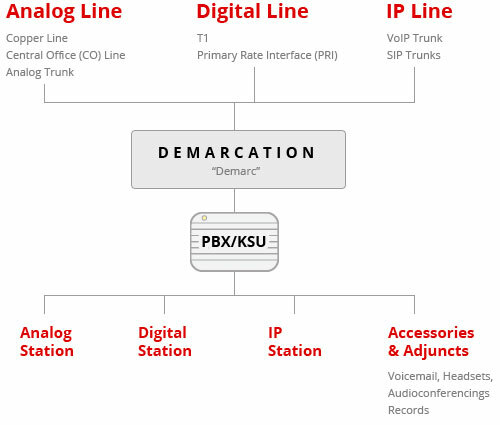 The T1 or Primary Rate Interface (PRI), in simple terms, describes a digital telephone line that carries a large volume of voice calls through a single circuit. Understanding every aspect of a phone system will help you make the best decision when you are ready to purchase and install.